is clearly envisioned and executed as a handbook for librarians, archivists, and curators who find themselves leading project-based work. 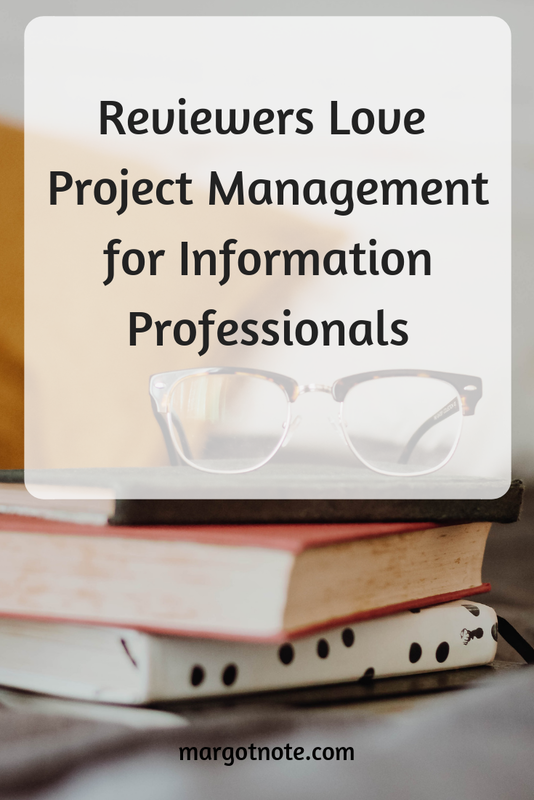 By empowering individual information professionals to manage projects more effectively, this work may play a part in shifting the organizational culture of memory institutions: from taking a defensive stance within an information environment in constant flux, to embracing project-based work as a way for libraries, archives, and museums to learn and grow and vitally engage the communities they serve. Note is the consummate project manager, and it shows in her handbook of project management for information professionals. This book knows what it is, and what it is not; it remains true to its project scope. It achieves its objectives, and delivers what it promises to its readers. Novice project managers will keep it close at hand; more experienced project managers will consult it when they feel themselves becoming stuck and will look back at past projects with a sharper eye for what they might do better. Writing is a solitary endeavor. You hope that your work will resonate with people, especially with librarians, archivists, and other information professionals who may already be stretched thin at work. You want to solve their burning pains and simplify their work. Nothing makes me happier than when my readers reach out to me to tell me about how my books helped them, when I'm cited in other books, or when I get positive reviews. I hope this is the first good review of many!